In selecting former Republican Congressman Ray LaHood for Secretary of Transportation, Barack Obama fulfilled his promise to make his cabinet bipartisan. The centrist GOP lawmaker was not above the partisan fray, however, when it came to Bill Clinton’s 1998 impeachment hearing, which LaHood presided over with enthusiasm. 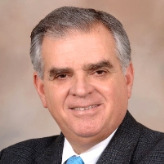 As a member of Congress, LaHood was not particularly involved in transportation issues, leading some observers to believe that his appointment either signaled that for Obama, transportion was not a high-priority issue, or that he wanted LaHood for his ability to liaison with Republican members of Congress. LaHood is of Lebanese ancestry; his grandparents emigrated from Lebanon to Peoria, Illinois, in 1895. Born on December 6, 1945, in Peoria, LaHood was raised by parents who ran a small working-class restaurant and bar. LaHood attended Canton Junior College (now Spoon River Community College) before transferring to Bradley University, where he earned a BS in education and sociology in 1971. Following college, LaHood taught social studies at junior high school for six years, and worked as director of the Rock Island County Youth Services Bureau from 1972-1974. He then switched jobs to director of the Bi-State Planning Commission, which dealt with housing and transportation matters, serving from 1974-1977. LaHood’s political career began in 1977 when he joined the staff of Republican Congressman Tom Railsback. In 1982, he was appointed to a seat in the Illinois House of Representatives. When he ran for the office in November of that year, he was defeated. He then joined the staff of Republican Congressman and House Minority Leader Robert Michel, becoming his chief of staff. As a veteran of the House Appropriations Committee, LaHood embraced federal spending as a way to spur economic growth, and he was closely involved in efforts to improve the Illinois transportation network by securing federal money for major highway construction and airport expansion. LaHood also served on the House Transportation and Infrastructure Committee during his early years in the House. He has been a big promoter of ethanol as part of his interest in agriculture issues. Prior to the 2008 election, LaHood announced his retirement from Congress. During his years in the Illinois delegation, he developed a close relationship with Rahm Emanuel, who also represented Illinois in the House, but as a Democrat, before becoming Obama’s chief of staff. LaHood’s wife, Kathy, worked for five years (2000-2005) as a business manager for the Council of Independent Colleges in Washington, DC, and then took over as business manager for Goodwill Industries in Peoria. The couple has four children and six grandchildren.